Nestled in the St. Lawrence River and on the eastern end of Lake Ontario is a vacation seekers paradise. The Thousand Islands are a group of islands that straddle the US and Canadian borders. This unique landscape is home to more than 1800 islands with the quaint town of Gananoque, on the St Lawrence River, as its gateway. The area stretches for over 50 miles and leaves lots of room for visitors to explore. The islands range from just a few feet to up to 40 square miles. To be designated as an island, there has to be at least one square foot of land above the water level and two living trees, although there are others who count it as an island if it has at least one tree. Not all of the islands are inhabitable or worthy of visiting, but many are, and you will find everything from castles to restaurants to quaint bed and breakfasts. One of the most notable structures is perhaps the Frontenac Arch, the ancient granite bridge that connects the Canadian Shield to the Adirondacks. The Frontenac Arch Biosphere is one of the UNESCO sites and is a beautiful place to explore. This entire area is rich in history, culture and charm, so visiting there should be on your bucket list, especially in the fall when the vibrant colours of the trees and crisp autumn weather give a glow to the region. 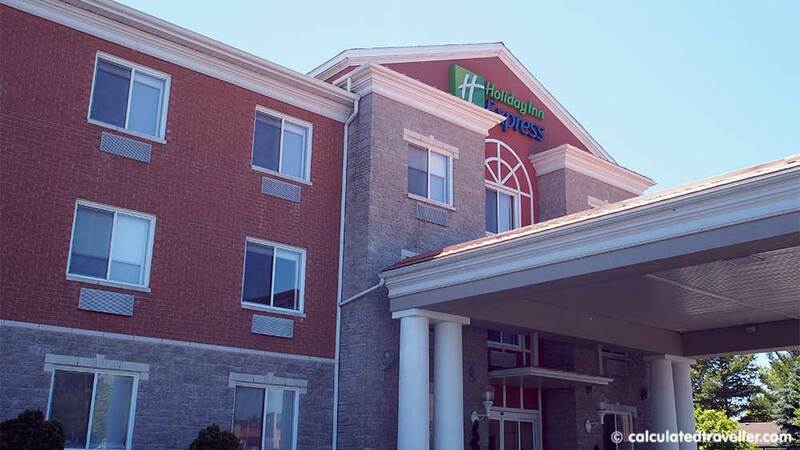 With an excellent complimentary breakfast and located across the street from the Shorelines Casino, the Holiday Inn Express & Suites offers a comfortable, clean and affordable stay in the city of Gananoque. This recently renovated property is close to the highway and convenient for exploring everything the Thousand Islands region has to offer. 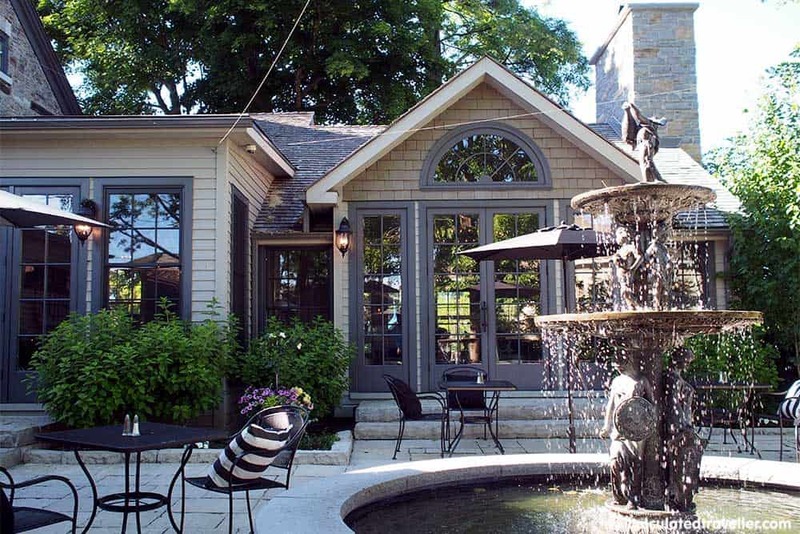 If you are looking for a cosy, bed and breakfast feel or just tired of chain hotels, the Gananoque Inn and Spa is a great choice. 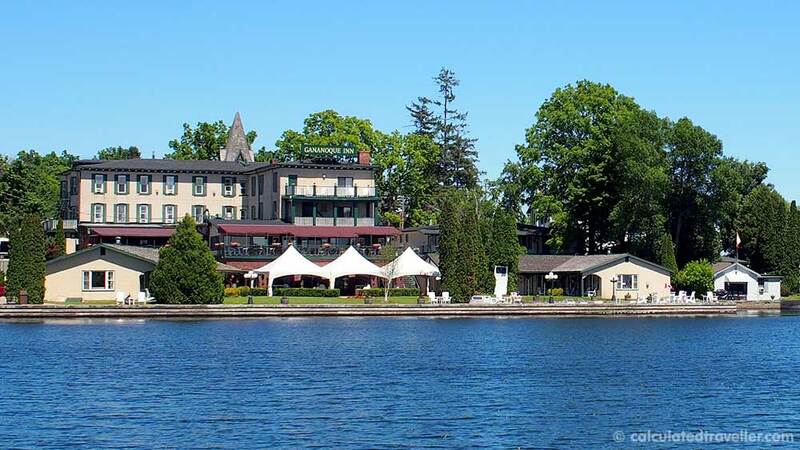 This waterfront Inn is the finest in Gananoque and offers luxury to those who want a little something extra special in their Thousand Island stay. The inn is an excellent retreat for couples and the ladies there is a luxury spa on the premises so you can relax, rest and recharge. This stunning B&B with gorgeous views of the river and spacious, well-appointed rooms that will make you feel like you are home during your visit there. Just a few miles from the Thousands Island Playhouse and other attractions, The Riverview B&B seems like it is a world away. Relax in the garden or on your private patio where you can take in the beautiful view of the St. Lawrence River and the Thousand Islands. If you are looking for the nightlife in Gananoque, hit the Shorelines Casino where you can hit the slots or table games, grab a bite to eat at the Windward Restaurant and Lounge or enjoy a show. Remember to ask your hotel concierge for any free play specials they may have with the casino and when you get to there, sign up for a members card. Members get discounts at the Windward restaurant. We were lucky to walk away from our visit to the Casino with $27 worth of winnings! The 1000 Island Playhouse, founded in 1982, is located on the picturesque banks of the St. Lawrence River and has proven to have a substantial economic impact on the area, attracting over 40,000 patrons a year. They also use a plethora of homegrown talent; over 80% of the shows performed at the playhouse are written by Canadians and most of the company’s actors, designers, directors and stage help come from all over Canada. This playhouse started when a group of community members along with Greg Wanless, the original founder, purchased the Gananoque Canoe Club. After extensive renovations over a few months, the 1000 Islands playhouse was in business. The property now houses two venues – the original 360 seat Springer Theater and the 160-seat Firehall Theater. There is an eclectic mix of performances from large-scale musicals to small comedies both contemporary to classical. Located in a historic house, Riva Restaurant is perfect if you are looking for a fine-dining experience in a beautiful location on the other side of the bridge and sculpture park. You can enjoy your meal in the elegant dining room or enjoy it on their spacious outdoor patio. Inspired by Italy, Riva is a modern version of an Italian tavern and has dishes ranging from Pizzas to Chicken Cacciatore. The Gananoque Farmer’s Market at Town Hall Park isn’t just a great destination for shopping for fresh produce, there are quite a few food choices as well if you are hungry. Take your pick of prepared foods from around the globe such as Mexican, Indian and Ukranian. Open June to October every Thursday night; you can stock up on baked goods and quick eats while you enjoy the bounty of the region. Located near the waterfront, the Purple House Cafe is in a prime location. 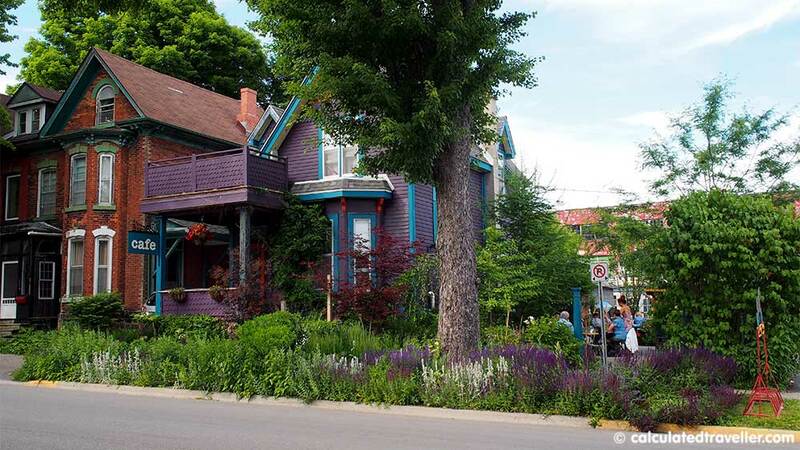 With a simple, but delicious menu, it makes a great place to stop for a light bite to eat as you explore Gananoque. Also, they have an impressive amount of gluten-free options from gluten-free pizza to desserts. Shopping in Gananoque is an experience in itself. Unique shops fill this area, and you can find everything from speciality honey to home goods. They even have an old-fashioned General Store. One of the stores you will want to visit is the Heather Haynes Gallery. This shop is a family affair as Heather’s son Whitney Montgomery is also an artist in residence there. 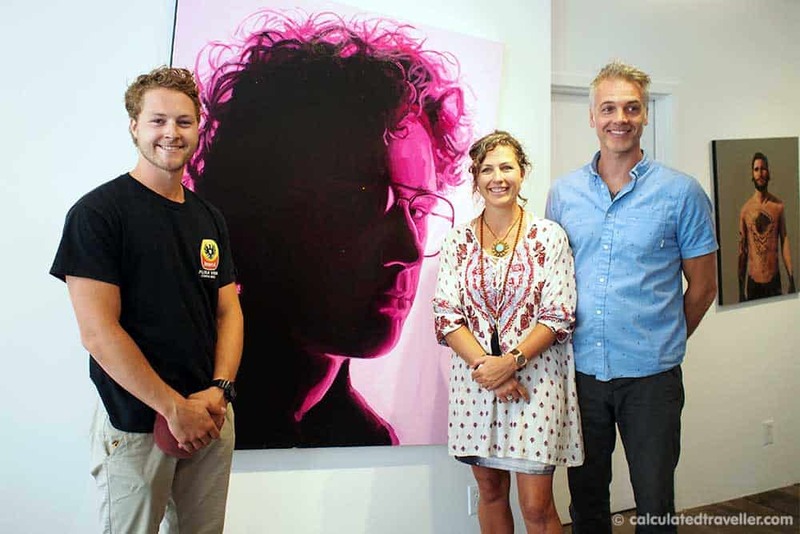 While we were visiting, we had an opportunity to check out his current show, “Experience with Light”. Next stop by the Dennis Connor Gallery and Interior Design. There you can find impressive art, including Inuit art and upholstered furniture. 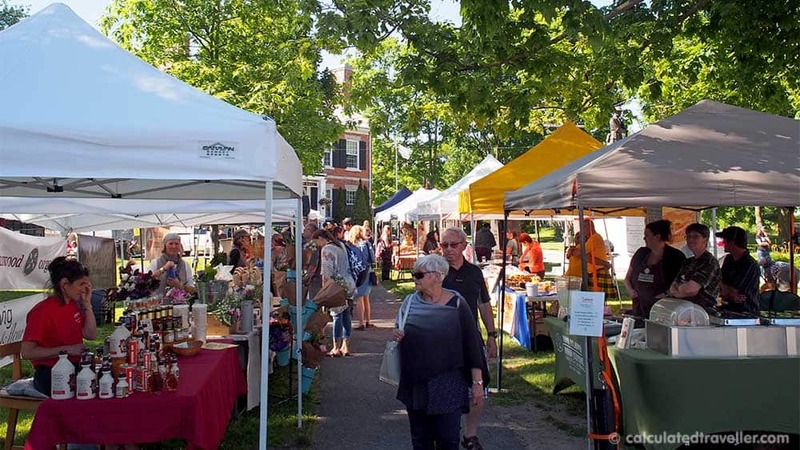 On Thursday evenings, make your way to Town Hall Park for the Gananoque Farmers Market to grab a meal and peruse the handcrafted soaps, canned goods and more. With access to the water and a unique landscape, the Thousand Islands is the perfect place to get outdoors and have an adventure. Here are a few of our suggestions for creating a memorable Thousand Islands vacation. One of the best ways to see the 1000 Islands is to travel by kayak. We took the 1000 Islands Kayaking tour and highly recommend it. 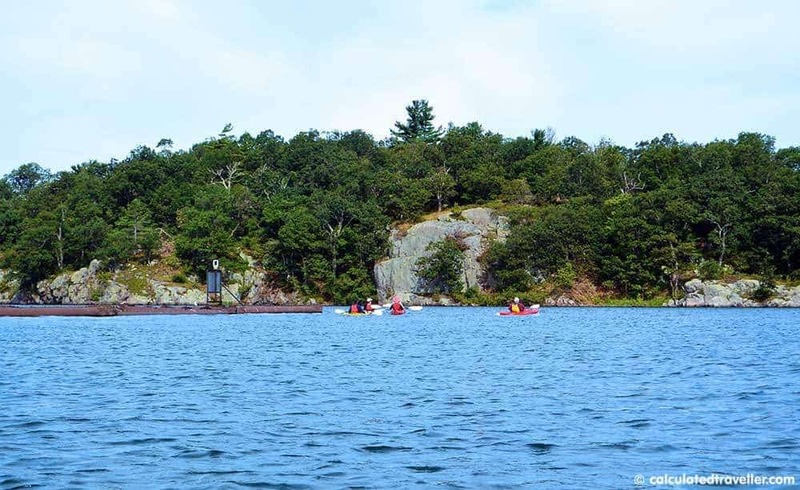 Not only can you learn the fundamentals of kayaking, but you get a unique history of the islands and a breathtaking view of the Frontenac Arch Biosphere Reserve. Read an in-depth article about our kayaking experience in the Thousand Islands here. To see the 1000 Islands from above, try the 1000 Islands Skydeck Tower. This tower seems a bit out of place for an area filled with natural wonders, but it offers spectacular views of the islands from three different viewing levels. 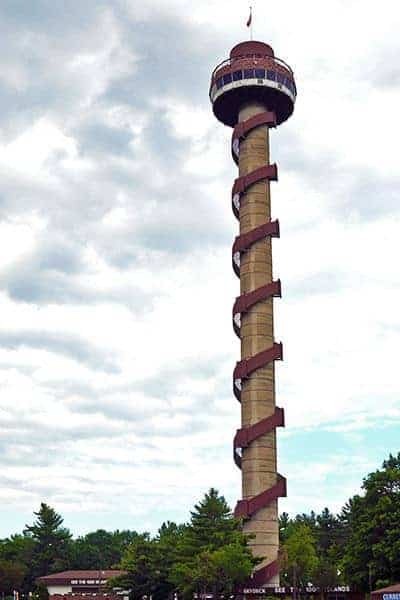 This tower is 400 feet high and offers panoramic views of Wolf Island, the Boldt Castle and other famous sites. Interested in reading more about Skydeck Tower? Click here. Check ticket prices for the Skydeck Tower here. 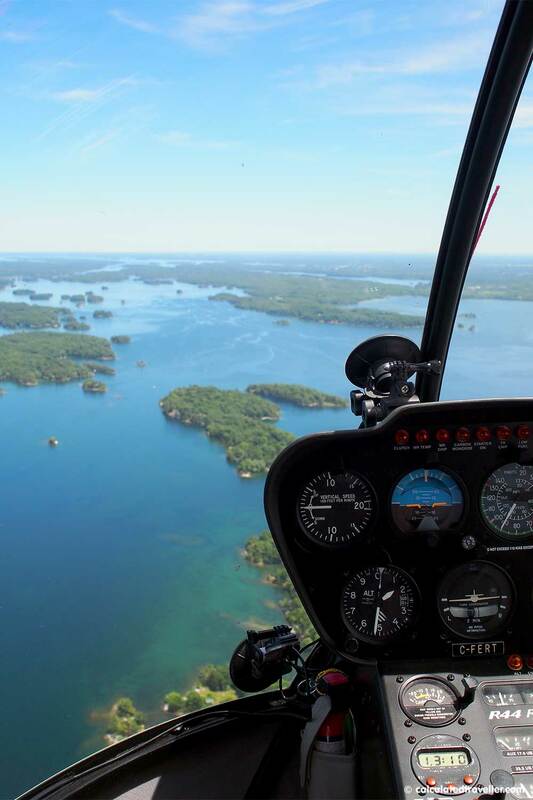 If you are seeking more adventure, head to the sky on the 1000 Islands Helicopter Tour where you get a bird’s eye view of the 1000 islands. Various tours range from 10 minutes to an hour, or you can charter a helicopter for an extra special excursion. Check helicopter flight prices here. Try a cruise on the Gananoque Boat Line. We recommend the romantic dinner cruise to Boldt Castle. This impressive castle was built and once owned by George Boldt of Waldorf Astoria fame. Now it is owned by the Thousand Islands Bridge Commission and greets thousands of visitors a year who want to tour its impressive structure and grounds. Another boat ride to take is through the Rideau Canal, a UNESCO World Heritage site. The canal connects Ottawa to Lake Ontario and the Saint Lawrence River at Kingston, Ontario. 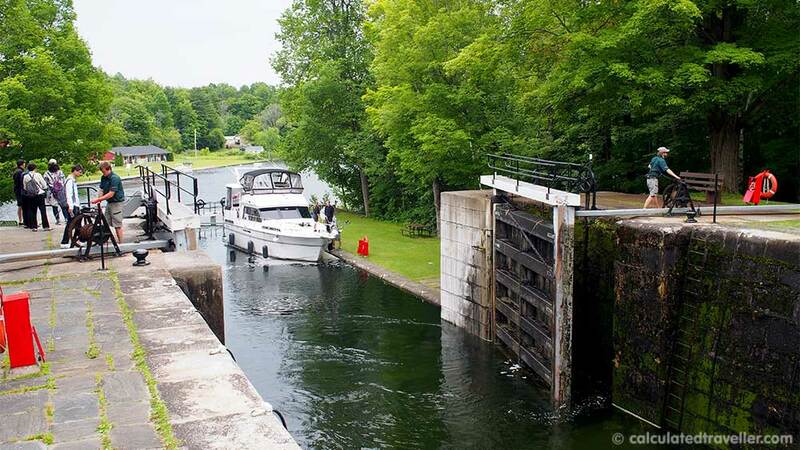 You can ride through the locks just as millions of vessels have for many years and see the sights of the St. Lawrence River. Before you leave, be sure to check out all that the waterfront in Gananoque has to offer. There you will find museums, a splash pad and plenty of outdoor space to enjoy all while visiting the gateway to the Thousand Islands. 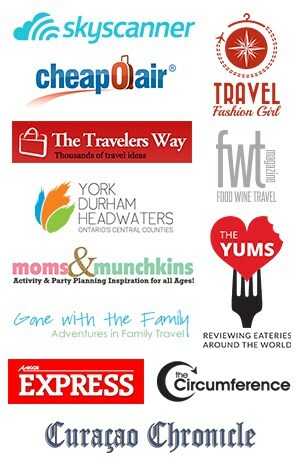 Whether you are travelling with extended family, or heading to the Thousand Islands on a romantic vacation with your honey, or escaping on a girlfriends getaway, there is something here for everyone. 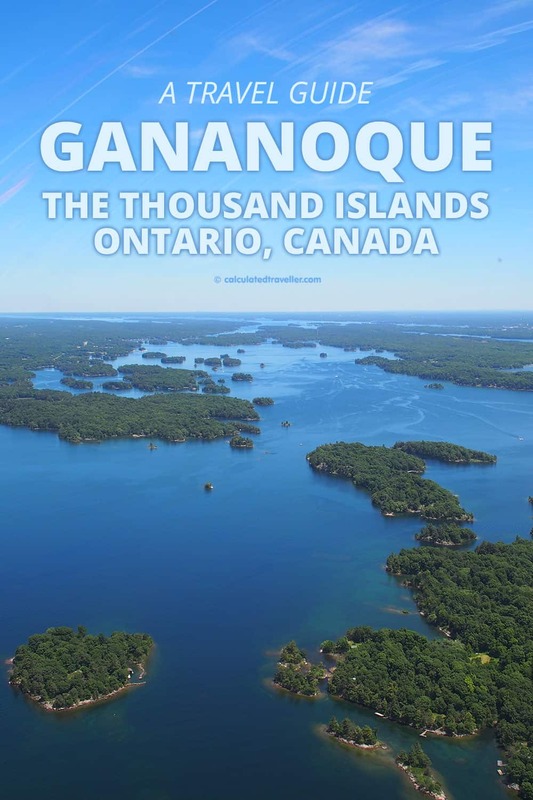 Have you been to the Thousand Islands and Gananoque? 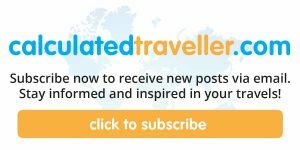 Travel assistance provided by 1000 Islands Tourism who did not review this article prior to publication. All opinions are entirely those of the author.